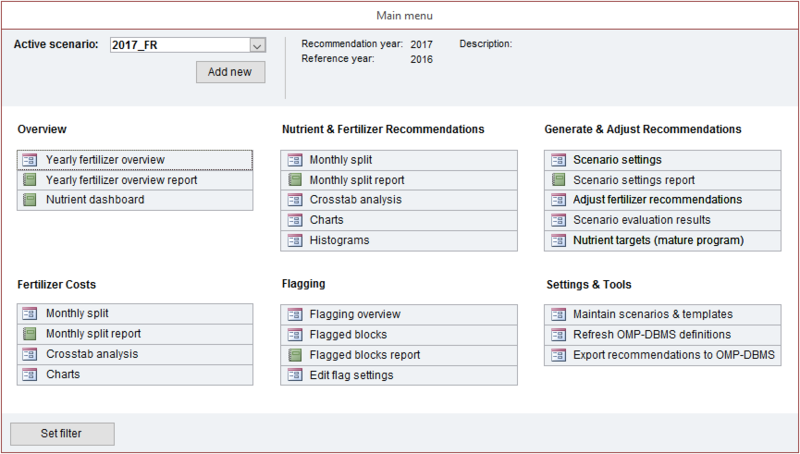 OMP Fertilizer Planner (OMP-FP) is computerised decision support tool that works with OMP. Block specific fertilizer recommendations based on agronomic data stored in OMP. Identification of least costly fertilizer nutrient sources based on a list of available products (price, nutrient content). Scheduling of fertilizer by month. Fertilizer schedule for immature palms. Once recommendations have been prepared in OMP-FP, data is copied to OMP so that fertilizer application can be monitored against recommendations. The preparation of fertilizer recommendations is a key part of oil palm management because fertilizers are usually the largest variable cost of production. The OMP-Fertilizer Planner can be used to prepare fertilizer recommendations for immature and mature plantings based on rules applied to data (e.g., yield, leaf analysis, soil type) store in OMP. Preparation of fully costed fertilizer programmes. Multiple scenarios can be prepared (e.g., for bull or bear market conditions). Recommendation procedures can be audited easily. Recommendations can be copied into OMP for close monitoring.